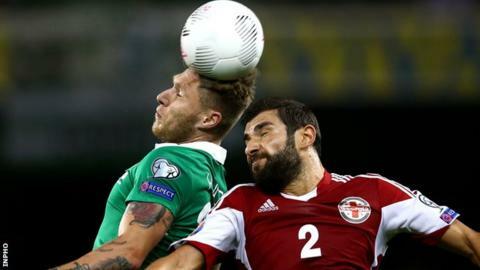 Republic of Ireland midfielder Jeff Hendrick was delighted with his match-winning contribution in the 1-0 win over Georgia on Monday night in Dublin. His superb run set up Jon Walters for the goal which keeps the Irish in contention for a place at next summer's Euro 2016 finals in France. Hendrick, 23, said he was unhappy with his display until a dazzling solo run and pass to Walters in the 69th minute. "I got past and Jonny made a great run and just tapped it in," Hendrick added. The Derby midfielder produced one of the few moments of genuine quality in the priceless victory, cutting in from the left and slipping the ball through a defender's legs. He then danced past two others before picking out striker Walters in front of goal. "I gave the ball away maybe three times before it, going sideways and backwards and not really being positive with the ball, so in my head, I was saying, 'Next time I get it, I'm just going to go at them and show a bit of positivity'. "Thankfully it worked and Jonny got the goal. "The two of them were closing me down, so obviously I had to try to go through them. "I could have maybe fallen over, the way it was going before, but I got past. Obviously we are all delighted." Hendrick won his 15th senior cap against the Georgians and is rapidly becoming a fixture in Martin O'Neill's midfield. The Derby midfielder looks certain to play in next month's showdown against Germany with both Glenn Whelan and James McClean suspended after picking up third bookings of the campaign. "Obviously I'm happy the manager has shown a bit of faith in me by playing me in the games. "I have got to work hard not only for the team, but for myself. I don't want to let the players down when I'm out on the pitch."